"I HAVE NEVER TRIED THE REBOUND/MINI TRAMP CLASSES BEFORE BUT HAVE BEEN AMAZED BY THE RESULTS. 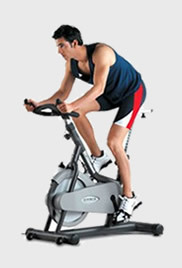 GREAT FAT BURNER"
At Jacobs Gym we are all about providing the full gym experience. Through our unique set of professional classes and top of the range modern equipment we encourage members of varying levels of fitness to get involved with whatever they feel most comfortable. Trained instructors are on hand all time to help out members whether it be with machines, weights or classes and are happy to discuss and tailor a members’ program to ensure their specific goals are met. Expertise, enthusiasm and excellent facilities. All of our Trainers are friendly, enthusiastic and have a passion for health and fitness. They are perfect for motivating and helping you to achieve your goals – whether that is increasing your overall fitness, body sculpting, or if you simply need advice on your nutrition. 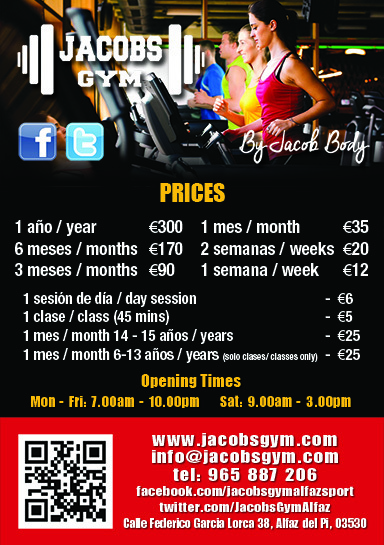 Jacobs Gym is offering FREE training sessions for children aged 14 & 15 years, from 8-10pm on Fridays. You need to pre-book and you must live in Alfaz del Pi. Please bring your NIE with you. Mon - Friday 7.00 - 22.00. Sat 9.00 - 15.00. Sun 11.00 - 14.00. Copyright 2019 Jacobs Gym, Southwell House, Florida S.L. c/Amsterdam 16, 03530, La Nucia, Alicante. CIF B54342340.